Posted March 28, 2015 by Marisa Hess & filed under Holiday. Good Friday and Easter Sunday are this weekend, and making dreamy desserts part of your holiday tradition is what drives us! 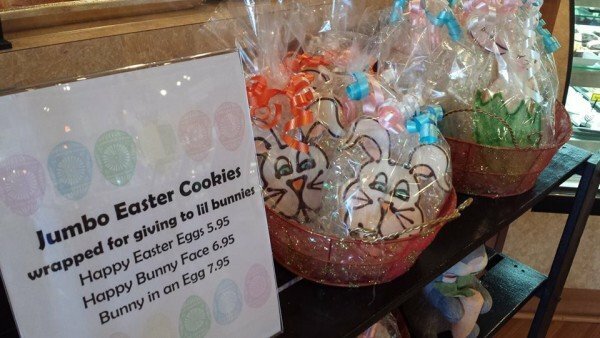 Whether it’s Spiral Ham, Easter Egg Hunts, Lamb Chops with mint jelly, or Easter Brunch out with your family, you’ll need some Easter Sweets. We’ll be sampling Brioche Hot Cross Buns all week in our bakery. Come by and ask for a taste! 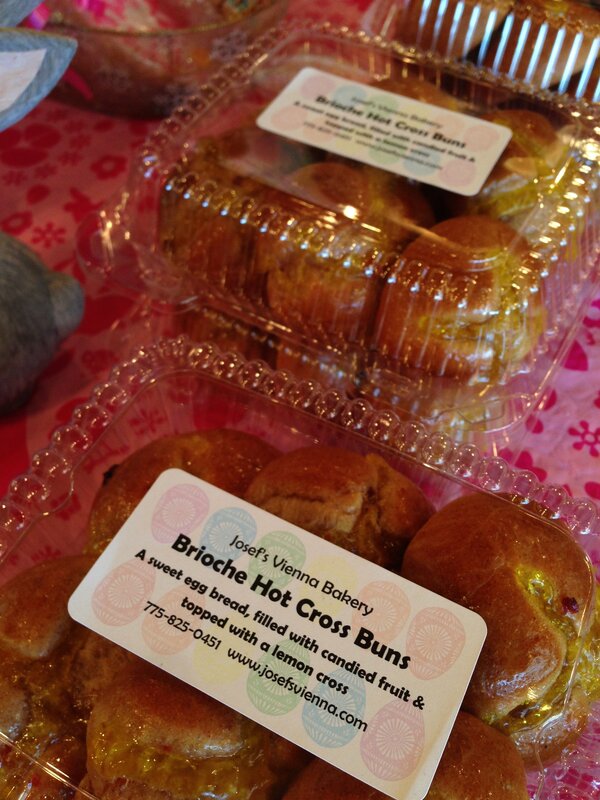 And then take some home (they are available in boxes of 6 and for special orders). If you join us for Easter Brunch next weekend, you will get to enjoy one with your meal: they’ll be served on every plate! Need a cake for your Easter dessert? We are making egg-shaped cakes in 3 special springtime flavors. They are 6″ cakes that will serve 6-8 hungry bunnies. Raspberry Lemon Cream – 3 layers of vanilla sponge cake, 2 layers of lemon french cream, a layer of Hero raspberry preserves, with lemony-yellow buttercream icing. Whole Wheat Carrot Cake – a rich, dense whole-wheat carrot cake studded with walnuts and raisins. 3 layers of cake, filled and iced with cream cheese icing. Coconut Cream Cake – 3 layers of vanilla sponge cake, 2 layers of coconut french cream, and a light buttercream icing covered in shaved coconut. They’ll be available in-store and for special order. Look for cake slices of these flavors in our Pastry Case too. 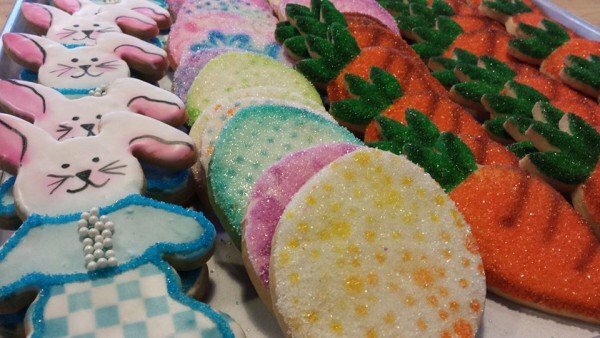 And I know you haven’t forgotten about our adorable Hand Decorated Sugar Cookies! We are making JUMBO cookies that are individually wrapped and ready to give to any little bunnies. We have Bunnies in an Egg, Happy Easter Eggs, and Happy Easter Bunny faces. In our case, we have hand-decorated cookies that are perfect for tucking into Easter baskets. Choose from colorful easter eggs, wooly sheep, sweet chicks, sitting bunnies, and standing bunnies in pjs. Petit Fours. Don’t forget about the Petit Fours! Decorated in pastel fondant and adorned with little Easter charms. How could you forget about these little guys?